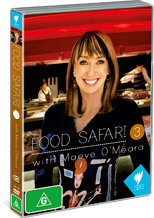 Congrats to Maeve O’Meara for this, the third season of her fascinating Aussie food trip, Food Safari. Each 30-minute episode is a ‘best of’ glimpse into a selected cuisine, properly fitting SBS’s ethnic broadcast charter. This double-disc volume contains food from: South America, Egypt, Germany, Iran, England, Africa, Syria, North America and Jewish. Each episode starts off with an ‘essentials’ segment, which basically highlights what produce and flavours the selected cuisine present its unique character and identity. From there, various Australian figures demonstrate one or more of their favourite recipes. While the clips stream by very quickly, lacking precision and all the steps, they are useful for providing a feel for what’s going on. Take for example the short take on that dessert classic, the Black Forest Cake: it is hugely entertaining but lacking a thorough explanation of process. While this may be grounds for criticism, the show’s website at www.sbs.com.au/foodsafari provides detailed recipes, videos, information on people and businesses featured and even online forums for opinion exchange. As a stand-alone, the DVD is merely gorgeous and entertaining. Coupled with the website, it becomes a true tool of information for the curious-minded home-cook who wants to reach out into the flavour rainbow Australia’s multiculturalism has provided. Video quality is great but the sound is only Dolby 2.0—this is understandable, given the lack of special effects needs in most kitchens! There are also bonus clips which never aired on TV. O’Meara is great on screen. She is always curious, never shy but importantly honest. You can tell when she doesn’t like something, no matter how politely she wraps up her reaction! (Watch out for her tasting of South American tea.) This is entertaining. She seems to have good rapport with all her culinary guests and when the chemistry is on fire, it’s even better! This is a must for any Aussie slightly interested in food beyond take-away or frozen meals. If you like your kitchen, or want to know it and Australia’s complex and exciting palate better, get Food Safari!